What makes a good website in 2014? Here are the top 8 most important priorities a business website must have to be successful and competitive today. The share of mobile devices is growing all the time so websites are required to work on devices of all sizes. Responsive design means that the layout of a website automatically adapts to the screen dimensions. The same site works across all devices automatically and no platform specific versions needs to be developed. In general the website must work on a broad spectrum of devices and browsers. HTML5 is the best technology (not Flash) as HTML5 is universally supported. All that is needed is a web browser, and all smart devices from phones to TVs have one. While at it, update the design to look stunning. People have grown accustomed to ever more good looking and easy to use websites and apps. 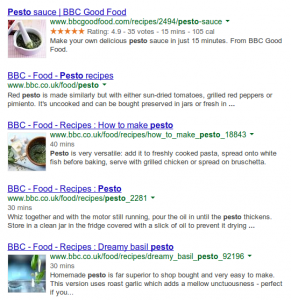 Micro formats example on query ’pesto’. The majority of visitors to a website come via search engines (mostly Google). With search engine optimization you get free search engine visibility and perhaps don’t need to buy ads. The headings and texts should describe the company using the most common terms, so that when somebody enters these terms in a search engine, the website has a chance of being in the results. In addition to relevant content, the technical presentation must also be correct. Semantic contents mean that the human readable contents is embedded in machine readable metadata that search engines and other machines can process. For example navigation and content should be semantically separated. Images should be described in meta attributes. Prices, opening hours, addresses etc. should marked using micro formats. The amount of mobile users (who in general have slow connections) has increased, and the speed of wired connections hasn’t significantly increased either. Having a website that loads fast is still very relevant. This is particularly demanding as websites should be ever more impressive, but the file size of big images should not grow. Even small differences matter if there are lots of users: Amazon reports that their sales grew 1 % for each 100 milliseconds their site was optimized to load faster. Fast pages get better higher search engine rankings. Do you want more users, who stay at your site for longer and are more return more often? Invest in speed. Using the www in domains is useless. Simply example.com is enough. Carefully choose domain names with your most important keyword embedded, as it has a big impact on search engine results. A website needs to share content where people already are, so that the content gets visibility. Push out your contents to Facebook, Twitter, Google+ and other similar services. Visibility sparks interest to visit the website. While users visit your website, promote sharing to social networks. Two-way integration leads to a positive loop! Also remember map services and directory services. Traditional channels still have their users: provide a RSS feed and an e-mail subscription option. For most businesses the point of a website is to increase visibility among potential customers. Well, how many potential customers has there been then? Do you have statistics and analytics? All investments into a website should be guided by the expected results (ROI). Results should be evaluated from visitor statistics. A weekly PDF report is easy to automate! Stylishness is an important part of the visitor impression, but content in most important. At minimum the content should be correct and current. Wrong information (e.g. price, address, opening hours) on a website will make people angry and spur mistrust. Management must always remember the website and value it as the most important communication channel. Updating the contents should be so easy that even the CEO can do it alone, without delay or costs. There must be a dead easy tool for content management! WordPress is the worlds most popular content management software. The most costly things that can happen in relation to software is related to vendor lock-in. Make sure you legally actually own your contents. Remember to save documents in an open standards format and not in proprietary formats that are not future-proof. Prefer systems that are open source and avoid being a hostage of closed source software. Break the vendor lock! Even an initially good solution will by time become just a vendor lock = monopoly = expensive. Open source software is the cure to single vendor lock-in. This article is based on the presentation held in the Seravo salad lunch in January 2014. Below are the presentation slides in English and Finnish. If you live or work near Tampere, check out the schedule of our next Seravo salads! Thanks for the article it was well written and helpful in my research.